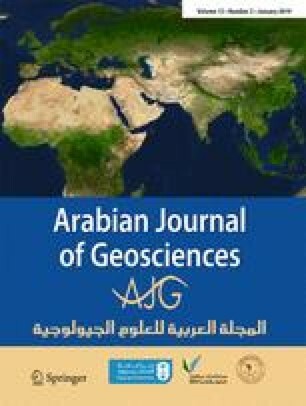 The meta-volcanosedimentary sequence from the SW sector of Wadi El Miyah area constitutes an example of the Late Proterozoic Pan African supracrustal rocks exposed in the Central Eastern Desert of Egypt. This folded meta-volcanosedimentary sequence is juxtaposed along about 8-km-long WNW–ESE-trending thrust contacts with a highly foliated ophiolitic mélange comprising serpentinites, metagabbros and quarztofeldspathic blocks and intruded by a gneissose hornblende diorite. Chaistolite-bearing mica schists crop out in three compositionally different metamorphic zones, marked by garnet, andalusite, and staurolite porphyroblasts, respectively. Microstructural data combined with careful mapping indicate that the studied metapelites were subjected to three deformational phases, D1–D3, each having its own impact on the development of planar and linear structures. These rocks witness the coexistence of a less ubiquitous dextral sense of shear and a later sinistral one that correspond to the D2-thrusting and D3-related phases, respectively. Geothermobarometry of the garnet-bearing assemblages combined with Th–U–Pb dating of metamorphic monazite by an electron microprobe indicates a counter-clockwise P–T–t path with a thermal peak assemblage of garnet + staurolite + chiastolite ± fibrolitic sillimanite at 622 °C/4.1 kbars during the D2 phase, with an age around 640–658 Ma. This is concordant with the ages assigned for the arc accretion phase in the Nubian Shield. The determined counter-clockwise P–T–t path of the studied rocks suggests that such a Buchan-type LP/HT sequence may be considered as a typical example of a regional–contact metamorphism which formed in areas that suffer from crustal thickening accompanied by emplacement of granitoids that affected the geothermal gradient of the crust. This article is part of the Topical Collection on New Advances and Research Results on the Geology of Africa. The author gratefully acknowledges the German Academic exchange office (DAAD) short-term scholarship. The fieldwork was conducted by funding from the Geology Department, Cairo University, Egypt. Thanks are also due to the Geological Survey of Egypt for accommodation in the field. The author is profoundly indebted to Prof. A. Hafez for suggesting the point of research and critically reviewing the paper. The author expresses her deep appreciation to Dr. M. Abdel Wahed for his critical review of the manuscript and for fruitful discussion which greatly improved the clarity of the map of the study area. Special thanks are due to Prof. B. Schulz and Mr. N. Langhof at the GeoZentrum Nordbayern, Erlangen University, for technical support of the chemical analyses and to Prof. M. Hamdan and Dr. Abul Haggag for their assistance in the field. Sincere greetings for Dr. S. Mukherjee for revising the mansucript .